Third time the charm for Endorphina’s Lucky Streak 3 Slot? The games programmers and graphics designers at Endorphina are on a roll lately, releasing a trio of sequential games in under four months. 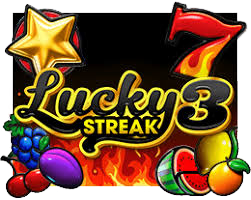 In November 2018, the brand launched the first in the series, Lucky Streak Slot. A month later in December, Lucky Streak 2 came to life. In the final hours of February 2019, it became a three-quel with the release of Lucky Streak 3. Endorphina knew from the start that this was going to be a quick-release series of video slots. Otherwise they wouldn’t have bothered to stamp a “1” on the promotional carriage for the initial release. In fact, they began promoting the launch of “Lucky Streak 1” back in October, making certain emphasis was put upon the numerical value of the title. Being so heavily promoted, the first edition arrived with gusto, bringing members of Endorphina online casinos a new 5×4 reel video slot with 40 paylines and a classic, fruit machine feel. The following month, creator’s unleashed the second installment, which combined the same fruit machine graphics with a more traditional 5×3 reel set, spanning just 5 pay lines. Now, the company is introducing fans of the series to the ultimate in classic fruit machine slots – a 3×3, 5-line game. If you like old-school slot machines, this is a game you don’t want to miss. I’ll start with the basics. Lucky Streak 3 is a very simple game. It comes with 3 reels, 5 pay lines, a medium variance and 96% RTP (return to player) that’s on par with the iGaming industry average. 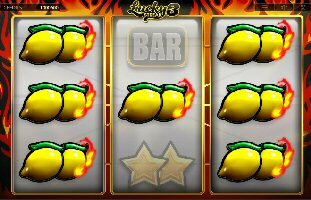 As the classic fruit machine description suggests, this slots’ symbols include (valued highest to lowest) flaming 7s, embossed stars, golden bells, grapes, lemons, cherries, bars and plums. As usual, it takes lining up three alike symbols on a single line to invoke a payout. There are no wilds, scatters or bonus symbols in this game. As I said, it’s very simple – very classic – very straight forward. The only noteworthy feature is a Multiplier that delivers 2x the total payout when a single symbol covers all of the reels in one spin. For example, landing Lemons on the entire 3×3 grid will award 5 payouts of 600 credits (3000), multiplied by 2x, for a total win of 6,000 credits. Third Lucky Streak Slot the Charm for Endorphina? While I do enjoy the look, feel and simplicity of a classic 3-reel slot machine, I have to disagree with the assessment of this being a “medium” variance game. It felt very much like a high variance to me. It was not uncommon for 20+ spins to go by without a win during my 200+ spin demo. There’s nothing wrong with high variance, if you enjoy that genre of games, but I’m a huge advocate of truth in advertising. If there’s one thing I really did enjoy about this game (and several others from Endorphina), it’s got to be the Gamble feature. I usually despise these and never play them, but the Lucky Streak 3 Slot isn’t like most. 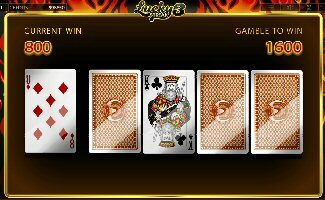 After any win, you have the option to gamble the profits for double-or-nothing on a simple card game. Five cards are dealt; the first face up. The players job is to select one of the four face-down cards. If that card is higher than the dealer’s face-up card, you win double your money. Here’s the kicker… once you click the ‘Take Risk‘ button, you are shown the face-up card, but still given the option to back out and take the winnings instead by pressing ‘Take Win‘. This came in handy several times, twice when the dealer got a 2 and 4 (I won both of those), and twice again when he got King and Ace (I backed out).